The children’s app is paired with a complementary parent and caregiver-focused platform and guide that helps drive conversations about disease and treatment, timed to the child’s progression and in language that aligns with the game. 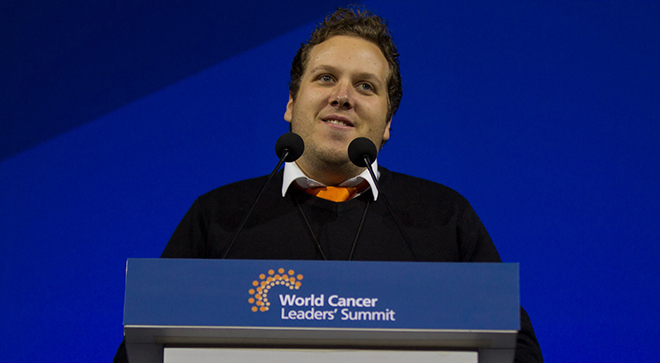 Hernâni Oliveira, the Grand Prize Winner of the Astellas Oncology C3 Prize, at the 2017 Union for International Cancer Control World Cancer Leaders’ Summit in Mexico City. For children with cancer, hospital stays can be scary. Unfamiliar environments and new people, painful medical procedures and tests, and being away from home and family can lead to high levels of stress and anxiety, as well as a decrease in physical activity – factors that can all affect the psychological and physical wellbeing of pediatric patients. Recent studies have shown an association between increased physical activity and lower anxiety levels during hospital stays, potentially resulting in improved quality of life for pediatric patients and improvements in the body’s response to treatments. But parents and caregivers often lack the knowledge and communication tools to help guide children in these areas. Hernâni Oliveira, Ph.D., a molecular oncologist, health communicator and digital media researcher, recognized the need for holistic solutions to both of these problems. Through a partnership between the Portuguese Ministries of Health and Education and the University of Porto, Oliveira developed the first Portuguese Creative Laboratory for Health Literacy, which aims to join the areas of medicine, health communication and informatics engineering to design and produce interactive technologies for patients and those who care for them. With pediatric oncology a priority, Oliveira and his team developed two separate, but complementary platforms designed to engage and educate pediatric cancer patients and their caregivers about the importance of physical activity during cancer treatment, and provide information and clarity on the often complex oncologic procedures and treatments themselves. 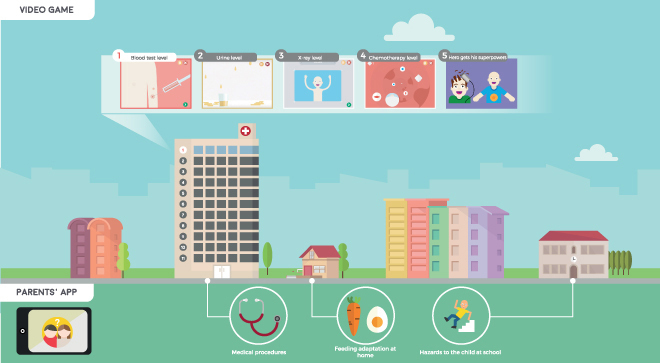 Created for use on smartphones and tablets, the HOPE Project augmented reality (AR) video game features a child superhero fighting cancer in three settings where children with oncological disease spend time: the hospital, home and street/school. The game combines a serious component that educates the child about oncologic disease and specific procedures like a blood test or X-ray, with innovative “exergaming” technology that tracks player movement to promote exercise. Currently in prototype testing, the HOPE Project was selected as the winner of the 2017 Astellas Oncology C3 Prize, a global competition to recognize and support non-treatment innovation in cancer care. Oliveira’s win and $50,000 grant from Astellas were announced and honored at the Union for International Cancer Control (UICC) World Cancer Leaders’ Summit in Mexico City in November. The UICC leads the World Cancer Day (WCD) initiative, an event celebrated every year on Feb. 4 all over the world. For the past three years, the theme of WCD has been, “We can. I can,” to explore how everyone – as a collective or as individuals – can do their part to reduce the global burden of cancer. It is in this spirit of collaboration that Astellas is supporting Oliveira as he works to get the HOPE Project tools into the hands of patients and caregivers who need them. So far, implementation studies of the app show high levels of intrinsic motivation in children with cancer and increased cancer knowledge among children and caregivers. “The goal of the HOPE Project is to both help increase physical activity levels among pediatric cancer patients and increase cancer health literacy among caregivers so that families can better adapt to a new reality,” said Oliveira. The HOPE Project's augmented reality (AR) video game aims to engage and educate pediatric cancer patients. Image courtesy of HOPE PROJECT. Adapting to a new reality is something Oliveira knows all too well. A year ago, he was diagnosed with lymphoma and has since gone through chemotherapy. Now in remission, his personal experience has given him greater insight and resolve to bring the HOPE Project to fruition. He plans to use the C3 Prize grant to conduct additional research on the correlations between physical activity and length of hospital stays and translate both platforms into English, French, and Portuguese. Astellas developed the C3 Prize to tap into the shared experiences and insights of millions of innovators, caregivers and patients to source ideas to help improve aspects of the cancer journey, like Oliveira’s efforts to improve pediatric care. The challenge is a way to complement the company’s commitment to delivering innovative treatment options to patients in need by addressing areas outside of treatment where patients living with cancer and the cancer community face the toughest obstacles. The personal experience of Mark Reisenauer, senior vice president, Oncology Business Unit, Astellas Pharma US, helped inspire the C3 Prize. Reisenauer was a caregiver during his father’s battle with head and neck cancer and, in that time, realized how little innovation addressed unmet needs in the cancer care journey outside of medicine. For more information on Hernâni Oliveira and the Astellas Oncology C3 Prize, visit c3prize.com or the Astellas Newsroom.